Join Me for Blog Jog Day, May 9! Need more visitors to your site? Jog on over to The Blog Jog Blog and see what the buzz is all about! Now Available! 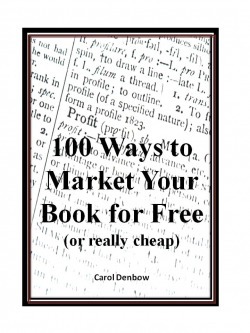 100 Ways to Market Your Book for Free (or really cheap) e-book only $6.95! click on the title to see more! 2008 Writer's Virtual Book Tour Schedule for Author Carol Denbow CLICK HERE! For every Carol Denbow book ordered through this Website, one will be donated to a help re-build a library in a disaster striken area and 10% of the sold book proceeds will be donated to Breast Cancer Awareness. Books must be ordered through one of Carol's Websites! Thank you for visiting. I understand you have literally millions of choices when it comes to clicking on a particular website link, and I want to first acknowledge and thank you for choosing mine! This website will offer you small business assistance, business and home life stress relief, and introduce you to my newest release, "100 Ways to Market Your Book for Free (or really cheap)." You are visiting my primary website. I am the author of six non-fiction books and hundreds of helpful on-line articles. In addition, I am the editor for A Book Inside Blog, and my most proud accomplishment, mom of two awesome grown children, Justin and Jennifer. Carols books include, Are You Ready to Be Your Own Boss?, Stress Relief for the Working Stiff, and A Book Inside, Writing, Publishing, and Selling Your Story. Carol's books are available here and through Amazon.com and other fine book sellers. Please enjoy looking through our website and contact us with all your questions, comments, book orders, and e-zine subscription requests. Send us an e-mail. NEW! "17 Top Business Start-up Articles by Business Expert Carol Denbow"
For every new copy of Are You Ready to Be Your Own Boss? "17 Top Business Start-up Articles by Business Expert Carol Denbow"
Or buy this new e-book for just $3.99 by visiting our "Business Books" page. I Love Talking Books! Audio books in all subjects!